I have said it before and I will say it again, we are a family full of NERF LOVERS! We love us some Nerf gear. Last year we made sure that we got some amazing stuff so that we could have even more amazing Nerf battles and we were all happy campers. Even Mommy and Daddy got some amazing nerf gear. We love that there are two colours available when it comes to the RIVAL line. This way we can choose teams. SO MUCH FUN! 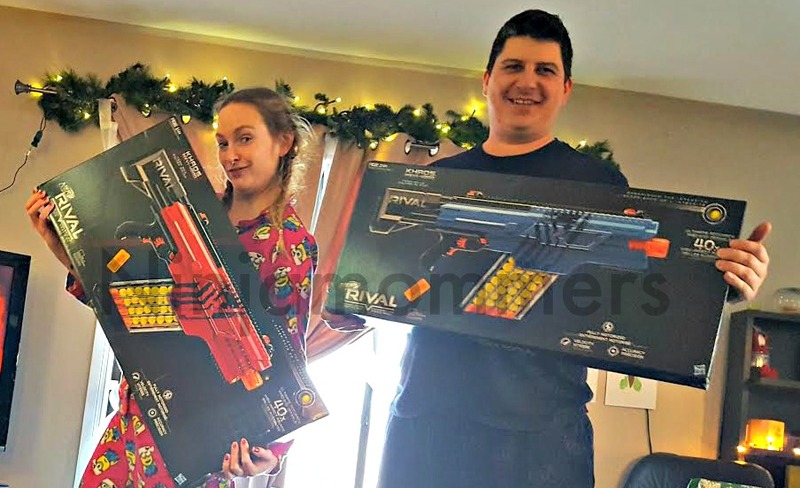 After this, we also got some of the NERF masks for each of us and went out and got some more cartridges and rounds because you can never be too prepared to engage in an amazing NERF battle with your family! 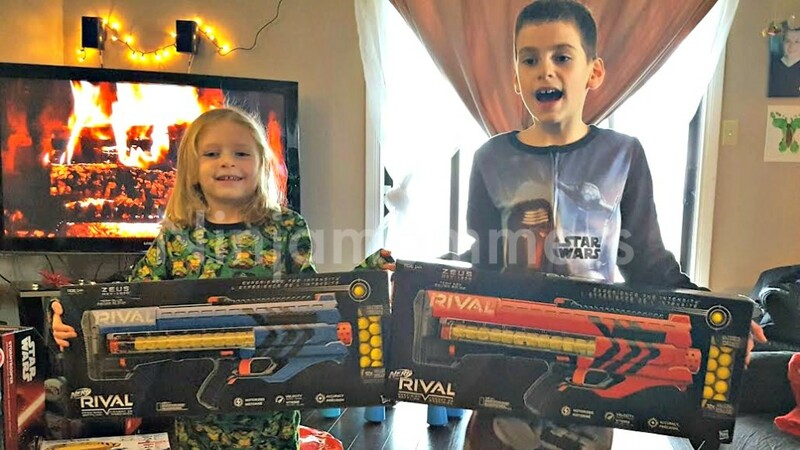 (I always win, my husband will tell you otherwise, but he is wrong…) The pictured nerf RIVALs are not the same as the new one we got this year though, The Nerf RIVAL Nemesis MXVII-10K Blaster is quite different! I am serious when I say that I truly believe that NERF is for kids of all ages… including us big kids. My husband is getting another NERF RIVAL this christmas but shh… don’t tell him. 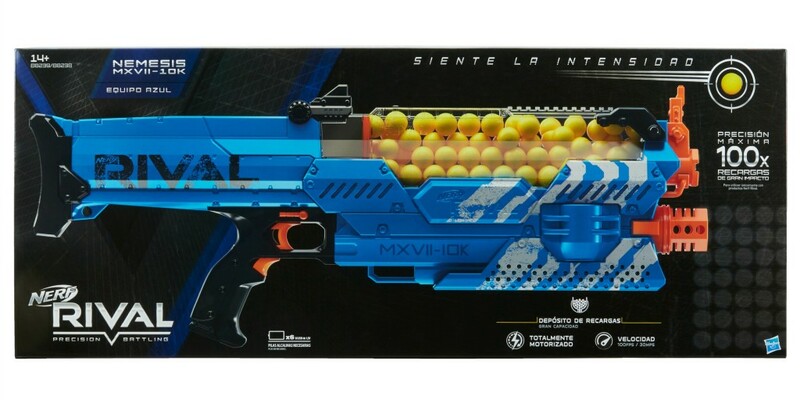 We also got our son the Nerf RIVAL Nemesis MXVII-10K Blaster this year and wanted to share with you just how AMAZINGLY cool it is. If you want to take part in an intense head-to-head battle with power and precision, look no further than the Nerf Rival Nemesis MXVII-10K blaster! This beast boasts an amazing high-capacity hopper that can hold up to 100 rounds that are not lacking in the impact department. This motorized blaster is sure to provide you with hours of entertainment and WINNING. The Nerf Rival Nemesis MXVII-10K blaster is not only easy to load and quick to unleash a fury of blistering rounds at an astounding velocity of 100 feet per second but it is also available in either red or blue (sold separately) so you can choose your colour and battle as a team! It is so neat that you can choose which blasting method you need to use depending on the situation! We are totally in NERF LOVE! The Nerf RIVAL Nemesis MXVII-10K Blaster is going to make this Holiday Season a BLAST for anyone on your Christmas List. Ninjamommers was provided special perks in order to facilitate the 2017 Holiday Gift Guide, all opinions are of her own and not influenced in any way, shape, or form.